Barbara Gaines: I did Hamlet over twenty years ago when we were still performing at our first home before moving to Navy Pier. I knew it was time that I direct it again, but differently. Time moves on, and we all change—as does Shakespeare. The first time I directed Hamlet, it was about politics. Fortinbras was an important character. This time, the play is much more intimate. How did you personally enter into the world of this play? I didn’t have a way into this story at first. I sat at my desk and spent hours looking at the first words of the script and had no inspiration. I put my music on shuffle and when Enya’s ‘I Could Never Say Goodbye’ popped up, it triggered a memory. I realized for the first time that I never properly mourned my dad, who died suddenly in 1987. The play opens and we see Hamlet grieving for the sudden loss of his father. Returning to this play now, I thought I could learn something about grief. And of course, you learn about life, as well. 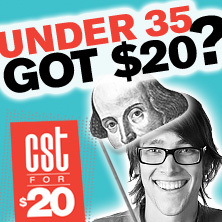 Shakespeare never lets you learn about just one thing. When does the play become a tragedy, do you think? For me, when Polonius dies. It’s difficult to excuse Hamlet for killing Polonius. Yes, he understands his actions as betrayal, but is that a reason for death? I don’t think so—not 400 years ago or today. Do you think Hamlet’s actions are more forgivable if they are the result of madness? In your mind, is he mad? No, I don’t believe Hamlet is crazy. My view of ‘madness’ or mental illness is naturalistic. We all experience moments of madness. Madness is a part of every one of us. And Hamlet responds to all his pain in an impulsive way. Do you think he changes by the end? Yes, he does evolve. Before the fencing match with Laertes, he assures Horatio that, ‘There is special Providence in the fall of a sparrow.’ That, to me, is an enlightened moment. There’s meaning in every life—a sparrow’s, Polonius’s, even Claudius’s. Life is this very moment that we share now. Hamlet finally understands that. Does he ever deal with his hatred for Gertrude, and how cruel he is to her? He’s terrible to his mother, but she’s also thoughtless of him. Her marriage weeks after his father’s death—and to his father’s brother—that would present a challenge for most people. The Ghost tells Hamlet of ‘my most seeming virtuous queen.’ Hamlet’s seeming virtuous mother. And that likely adds to his venom against her. Do you think Hamlet is aware of the implications of that one word, ‘seeming’? He certainly understands that his mother has betrayed his father and that lust has made his mother disloyal. And she didn’t marry just anybody—his mother married his uncle. She has ‘posted with such dexterity to incestuous sheets.’ All this is more appalling to him than his father’s death. It seems like he cannot mourn for his father because he’s consumed with thoughts about his mother. What about Ophelia? How do you see her character? Ophelia never had a chance in this world. Her life has been ruled by men. And so when the men in her life leave her, she implodes in on herself. There’s no other way for that story to end, not for someone as fragile as Ophelia. That’s like asking which is my favorite child! All I’ll say is that so many of the scenes surprise me, and how they’ll appear on stage isn’t just up to me. It’s up to the actors, to everyone who makes a production happen. And so it matters a great deal what they think and feel. That’s the rehearsal process—it’s give-and-take. You keep what’s good and then you work to pare everything down to the point where it feels authentic—to me, the actors, and hopefully, the audience.